Sanctuary Chief’s Camp is located in the Mombo concession on Chief’s Island, in the Moremi Game Reserve. With "Predator Capital of Africa" as a nickname, you can probably guess that this area is great for game viewing. The seasonal delta floods of ensure you will have a different view every day you wake up - from a dry, flood-plain teeming with thirsty wildlife to a tranquil lagoon at sunset under a bright orange sky. This is the camp where you come for abundant wildlife and game viewing in a luxurious setting. 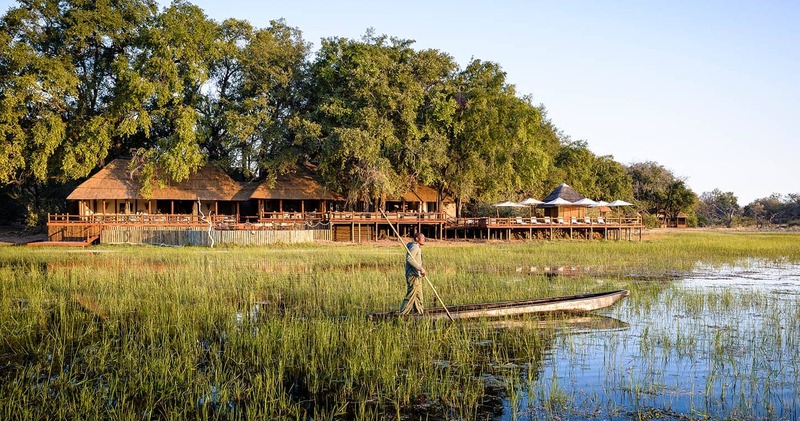 The camp is operated by manager Evelyn, who is also a proud Botswana citizen, and together with her team of guides, cooks and many more, she will meet all your needs before you even realise them. How? 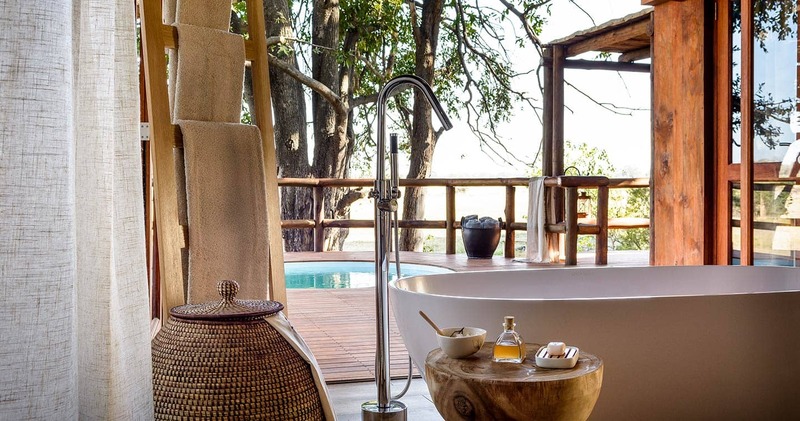 By making sure all the guides know the area like no one else and even teach you how to track animals, or by using only the natural and eco-friendly Africology products during a pampering spa treatment. And, of course, by simply offering you a trip of a lifetime. Beautifully finished and spacious, twelve luxurious pavilions have handmade furnishings and private dining areas. All tents boast 5-star luxury, and then some. Appreciate the wonderful sense of openness and spectacular outlooks whilst relaxing in the tub: your bathroom has floor-to-ceiling, folding, glass doors. And if you can’t get enough of the view (and we promise: you can’t), the outdoor shower offers you a great wake-up or nighttime experience. Lotion, mosquito repellent, robes: luxury frills everywhere. 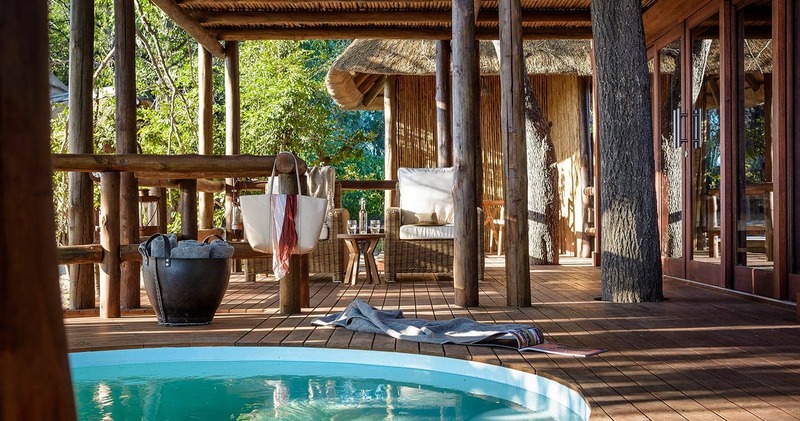 If you feel like cooling off, your tent extends out to terraces where you will find a relaxing plunge pool. The pool offers great views and is a perfect spot to soak up the tranquility. 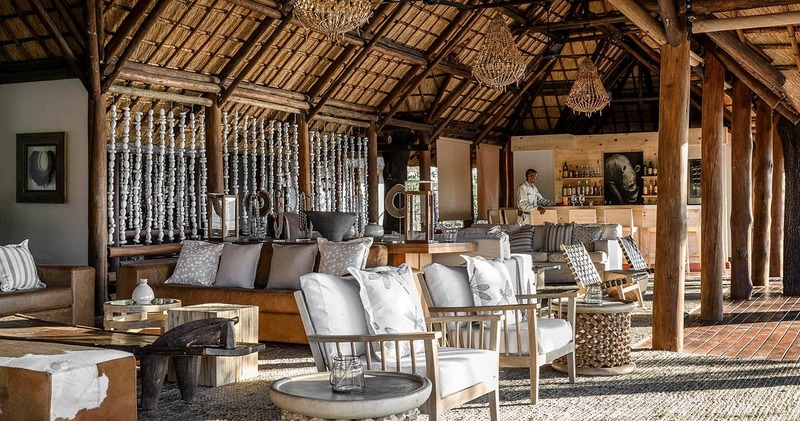 Sip sundowners around a blazing campfire or enjoy an authentic barbecue, and savour delicious meals stylishly presented in the dining room. Open-plan and safari-chic, the welcoming main space also includes a bar for great cocktails, a library, gym and kids playzone. Welcome to wildlife paradise. 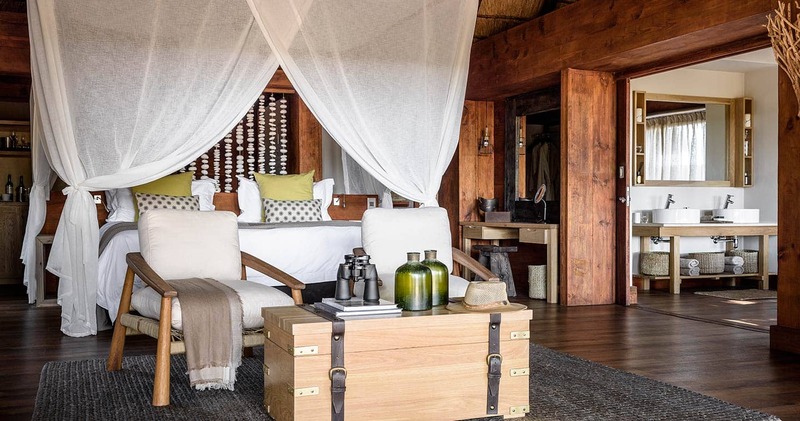 Sanctuary Chief’s Camp is right in the middle of one Africa’s best game reserves. Your day starts with a wake-up call and some of the best coffee you ever had, and after that it is time to hop in the comfortable seats of your safari vehicle (cozy blankets and warm water bottles provided). This camp offers game drives as well as mokoro (a traditional canoe) excursions. And these safari activities are often unforgettable: imagine viewing cheetahs with cubs, leopards, hyenas, elephants, buffalo, lions, giraffe, hippos, black and white rhino – they are all here. Predators roam the area regularly, so get ready for some excitement. Night drives and off-road driving are not permitted in the reserve, but the expansive viewing decks allow you to continue your game experience from the comfort of your own deck. In addition to great game viewing experiences at Sanctuary Chief's Camp, you are also able to indulge in invigorating spa treatments. A definite must after a long day in the African bush and the perfect way to end a day of spectacular game viewing. The rooms are the best, loved the outdoor shower, views are the best, overlooking game all day long. The game on safaris included all of the big five with ample time to sit and enjoy their every movement. Enjoyed cheetahs, leopards and lions on the hunt. Service is the best, food equally so. My visit to Sanctuary Chief's Camp was a trip of a lifetime. The staff was amazing, the room was beautiful, the view was incredible, wild animals were everywhere and the food was 5 star. I will never forget it, and I have thousands of totally amazing photos to help remember every detail. The camp has a completely new, designer look and re-opened in 2016. Please note: Indicated price is for a 'Bush pavillion', which is the standard room type at Sanctuary Chief's Camp. A single supplement is applicable. Special offer: A reduced rate is available when staying for three nights or longer. Read all about travelling to Sanctuary Chief's Camp on our getting to Moremi page. Chief's Camp is best accessed through Maun Airport. Children of six years and older welcome. 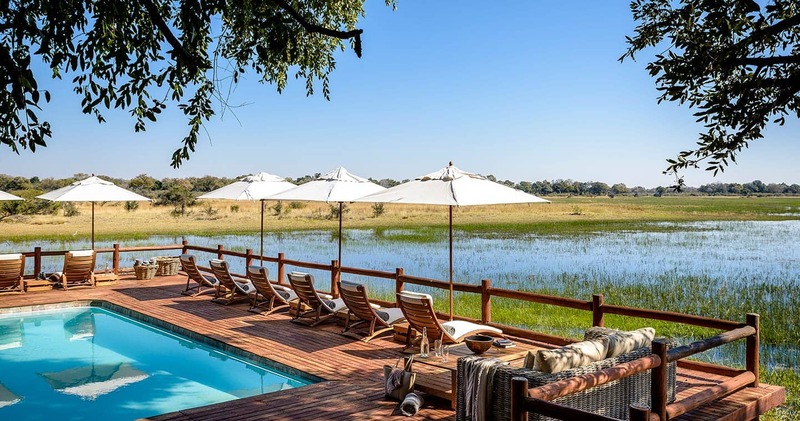 We hope you have found all information needed to decide that Sanctuary Chief's Camp in Moremi Game Reserve is the perfect place for your next travel adventure. Please fill in the contact form and we will get back to you soon!